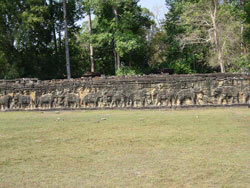 Terrace of the Elephants is an impressive, two and a half-meter tall, 300 meter long terrace wall adorned with carved elephants and garudas that spans the heart of Angkor Thom in front of Bapuon, Phimeanakas and the Royal Palace area. 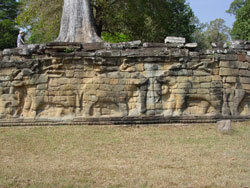 The northern section of the wall displays some particularly fine sculpture including the five headed horse and scenes of warriors and dancers. 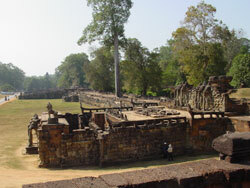 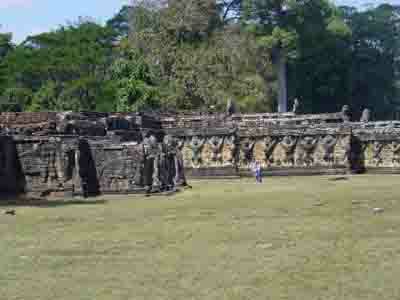 Constructed in part by Jayavarman VII and extended by his successor. 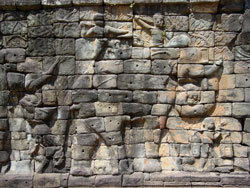 The wall faces east so the best lighting for photography before noon. 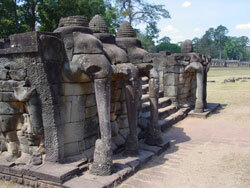 The Terrace of the Leper King is at the north end of the Terrace of the Elephants.